Dr Zara Celik is passionate about holistic health and wellness, and believes that beauty is reflection of our inner wellbeing and health. She believes in organic, natural, non-invasive treatments that aims to improve wellbeing and health of individuals and makes them beautiful as a result. 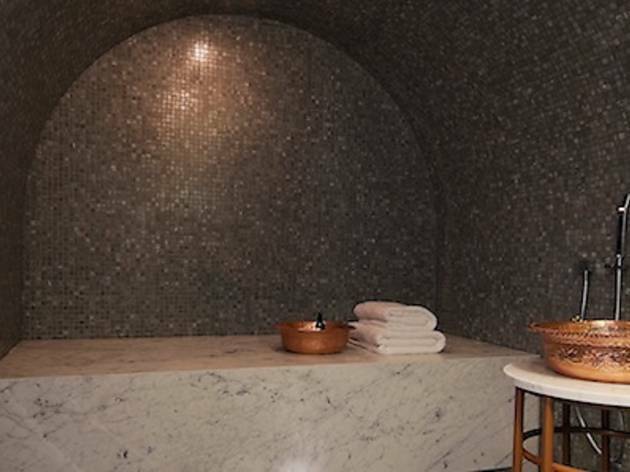 The rear of her Amara Wellness Centre in Brunswick is a hammam, providing a nurturing steam, massage and bathing ritual to Melbourne’s tired and weary, in time-honoured Turkish tradition. The front section is all about skin renewal and tightening, courtesy of the LPG Endermotherapie and Endermolift treatments. After a day of first-world problems I’m feeling pretty drained and not in any mood to be taking my clothes off. Thank god I’m here to do a job, because after three hours in this Sydney Road hammam, experiencing an authentic and wellness Turkish and Moroccan bathing ritual is now top of my advise-everyone-to-do list. Zara Celik, a chiropractic doctor, came to Australia from Turkey when she was 15 years old, and found she missed the ancient bathing rituals of her country. Determined to introduce the experience to a wider Australian audience, she toiled away on creating this beautiful hammam, decorated from top to bottom with intricate mosaic tiling (Zara looks a bit pale when we speculate on how long that must have taken). Each steam room has domed ceilings and heated marble slabs on which to lie. Customers strip down to a bikini – or shorts – and are joined in the room by the hammam therapist, or tellak, who is also dressed in swimwear and a traditional bath wrap – a pestemal. This is quite like any other relaxation treatment you might have experienced, in that the practitioner is very much part of the ritual. You will be massaged, exfoliated and soaped in the gentlest manner, with each cycle being completed with a rinse from copper bowls of warm water. The final rinse is cold, but somehow blissfully so. Finally, I'm moisturised and have Mira's Hand pure Argan Oil massaged into my face. As relaxation goes, this is an incredibly nurturing experience. It’s traditional practise for female relatives to bathe each other in Turkey, and so there’s also a sense of bonding here. It’s detoxifying and improves the circulation and metabolism, but also brings a wonderfully clarity. 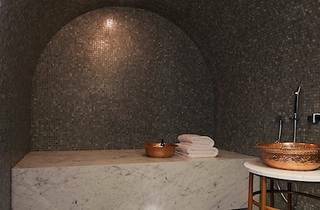 Prices range from $49 for a 20-minute steam session to $399 for a 4.5-hour package that includes a mineral-rich Rhassoul clay from the Moroccan mountains to detox the body and cleanse the hair and scalp, a 60-min full-body massage and organic facial using Phyts products, then into a relaxation area to enjoy organic berry nut mix with tea and a fruit platter. There are also rituals for bachelorettes, hens, mother and daughters, brides and new mothers, priced $120-$399pp. Workshops available at $120 per person, in which you and a minimum of four other friends can learn about the rituals. Endermologie mechanically stimulates cells, increases circulation, stimulates lymphatic systems, and as a result the skin is firm, toned lifted, soft and glowing. This LPG treatment, originating in France, has health, wellness, sport and beauty applications. LPG was founded in the 1980s by Louis Paul Guitay, who had suffered skin and muscle damage after a car accident. Part of his therapy was daily massage. Being an engineer, he had the idea of creating a machine that did the job automatically. Endermologie is the umbrella term for the different treatments he has innovated. Since 2006 Dr Zara Celik has been combining these treatments to tailor the optimal results for you. Its overall purpose is to massage the skin and bring blood to the surface, helping your skin to heal itself and become firmer. After you’ve put on a white mesh suit for hygiene and to prevent skin-drag, you relax on the Endermolab table while two rollers rotate in four different ways on your skin’s surface as suction is applied. It’s gentle and non-invasive. Lipomassage is used on the body, particularly on cellulite-prone areas and baby bellies, which are resculpted as the gentle kneading of the skin stimulates the beta cells in your body which naturally break down fat. Then there’s Endermotherapie – the health application of Endermologie. This targets tense, knotted areas, such as the back, neck and calf muscles. It's efective on muscular and ligamentous injurites, contractures, tightness, aches and pains, fibrosis, hypertrophic scars, lymphedema and fibromyalgia. To improve the appearance of the face and neck, there’s Endermolift. This feels more like a gentle patting of the face and can be used on delicate areas around the eyes. The result is a lifted and firmer face, making it particularly suitable for tackling jowls and double chins. Around 12 sessions are recommended for optimal results, with less frequent maintenance sessions following those. The Amara Wellness Centre is also home to Victoria's only Huber Motion Lab – an impressive machine that strenghtens the 180 core spinal muscles; great for sports injuries and rehabilitation.